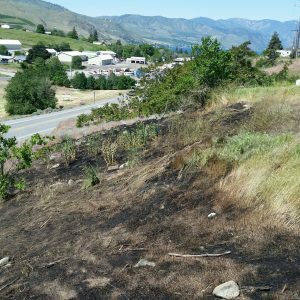 Chelan Fire and Rescue responded to an early morning brush fire on 05/17/2018 at 0745hr in the area of Golden Drive and SR97A. Responding units included Rescue 71, Brush 79, Brush 71 and Chief 701 with a total of six personnel. 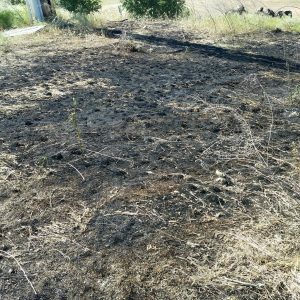 First unit on scene report a working grass/brush fire about 100 feet x 100 feet being pushed by winds to the east. 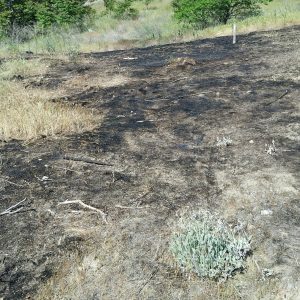 Chief 701 established command, assigned Brush 71 to the north flank, Brush 79 to the head of the fire and Brush 71 to the west side of the fire. The fire was contained in 11 minutes 36 second from 911 call and completely out after crews finished mopped up hot spots. Total call time 24 minutes 49 seconds. 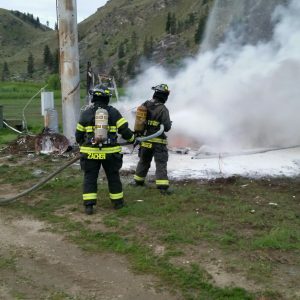 Volunteer Firefighter Recruits from Chelan Fire and Rescue, Entiat Fire Department and Orondo Fire Department train over the weekend. Great weekend class with a lot of energy, hard work and heart by all the Volunteer Firefighter Recruits. 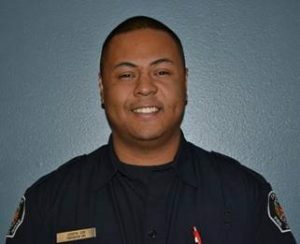 Big thanks to Chief Asher for helping out as a primary instructor; Dan Minor, Jon Mendoza, James Park, Cody Evans, Mark Cooper, Adam Jones and Brian Asher for serving as company officers / secondary instructors and Marcia Holmdahl, Robert Takagi and Lee Jones for providing support services. The weekend training started at 8 AM and end at 5 PM on Saturday and Sunday. The recruits worked through the heat of the day developing their skills and competencies. Weekend Firefighter Fundamental on Saturday included SCBA donning and re-servicing, hose and connections, hydrants and heeling LDH, pulling preconnects and reloading, hose handling of charged 1½” and 2½” attack lines with and without hose straps and nozzle operations. Sunday the recruits tackled extension ladder deployment, carrying roof ladder up an extension ladder, climbing Ladder 71 and a SCBA confidence/usage course. After lunch it was hose evolutions all afternoon until the end of the day when we conducted engine company evaluations. All the crews did well, Engine 72 under the direction of Dan Miner took best company of the weekend followed by Engine 79 with Cody Evans in charge. Again, great job by all involved, we saw a lot of effort and heart all weekend. Send my apologies and thanks to the mom’s and wife’s that sent their Firefighters to training instead of home celebrating Mom’s Day. 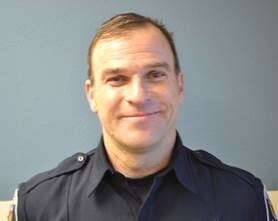 Congratulation to Firefighter/EMT Marco Aurilio and Joe Cox on successfully completing their probationary year with Chelan Fire and Rescue. FF/EMT Marco Aurilio and Joe Cox have been promoted to Firefighter 3rd Class. 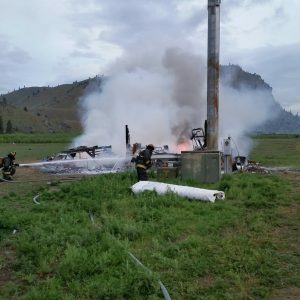 Chelan Fire and Rescue responded to a 5th wheel camper trailer fire this morning (05/09/2018) around 0527 hour at 91 Apple Acres Road. Command 7, Engine 71 and Tender 71 responded to the incident. 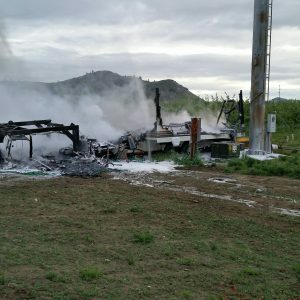 Engine 71 arrived on scene within 11 minutes 7 seconds of the 911 call and reported a fully involved 5th wheel camper trailer mostly burn to the ground with exposure to electrical service transformer located next to the trailer on the ground. Engine 71’s crew contained the fire to the trailer and used defensive fire tactics to extinguish the fire. Tender 71 was called in to provide water support. 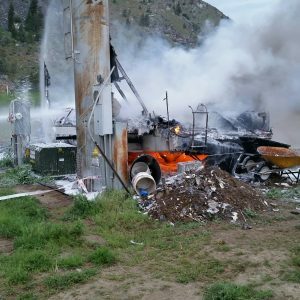 There was no indication of any occupants in or at the trailer at the time of the fire. 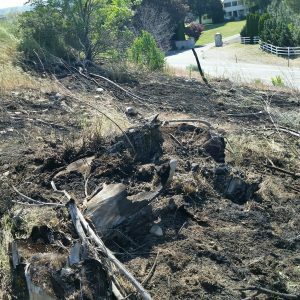 Fire is under investigation by the Chelan County Fire Marshal Office.